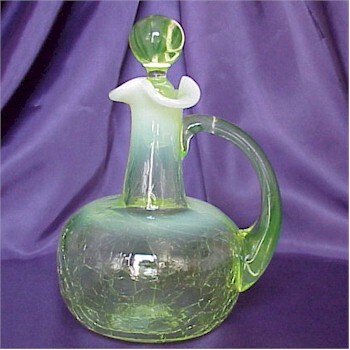 Crackle Glass Cruet in Vaseline Opalescent, Bargain Shack offers Boyd Glass, Mosser Glass, L.G. Wright, and Contemporary Collectible Glass including Vaseline Glass - J.B. Scottie Dogs, Pooche, Animal Covered Nests, Toothpick Holders, Salts, Glass Animal Figurines, Clowns, Dolls, Slippers, Vehicles, and More! If you love crackle glass and vaseline opal glass, this gorgeous Crackle Cruet in vaseline opal is for you. The fine crackle is accented with opalescence and terrific applied handle this stunning piece stands almost 7 inches tall. It is simply beautiful under a black light too and would make an excellent addition to your vaseline glass collection!